Somehow I managed to use up all of the week’s eggs in a 24-hour period without even realizing it. 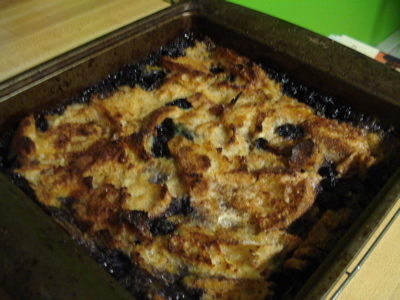 You see, I made bread pudding (far above, and from Mark Bittman’s big yellow book) in order to put my moving-towards-stale homemade bread to good use. Yesterday’s frittata (recipe here) was absolutely necessary, as I needed to procrastinate AND I had some summer squash begging to be released from the veggie drawer. Despite all of the reading I’m doing, I have been allowing myself some knitting breaks to clear my head, or, as in the case of this morning, give the coffee a little bit of time to work its magic. Also, it feels like fall here. Hooray for handknits! 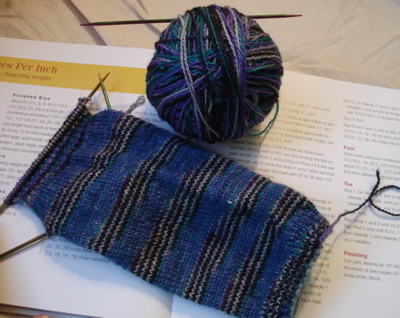 This entry was posted in kitchen, knitting and tagged bread pudding, frittata, june bug, kitchen, knitting, socks, yarn pirate by barefootrooster. Bookmark the permalink. 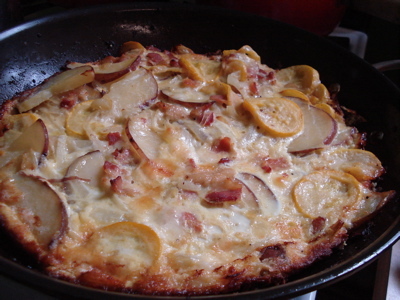 Mmmm, that frittata looks amazing. Cute sock! Cool sock! I love the striping, too. I like the sock color…what is it? I like the yarn, what is it?